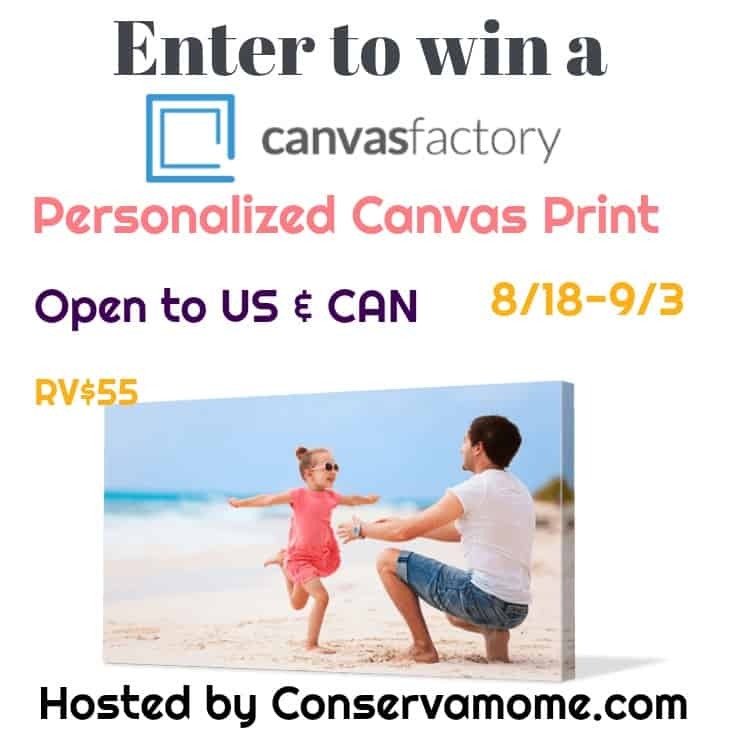 I’ve teamed up with Canvas Factory to bring you 5 reasons to Gift of Canvas . Although this is a sponsored post, all opinions are 100% mine. Gift giving can be tough when you want to get the perfect thing but you are on a tight budget. Thankfully, Canvas Factory is the answer to all your problems. I particularly struggle with finding the perfect gifts for my husband. He’s a hard guy to buy for because he has expensive and specific tastes. I love it when I come across things that I can surprise him with that I know he will love. 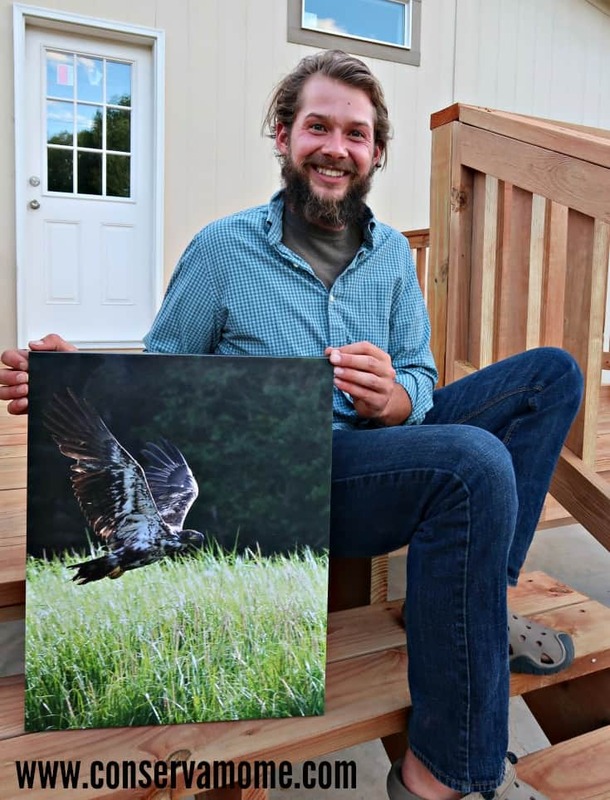 I was so pleased when I had the opportunity to get this beautiful print from Canvas Factory of a photograph that my husband took of an immature eagle near our home in Alaska. I didn’t tell him I had ordered it and he was thrilled to find it waiting for him when he got home from work. I loved that I was able to surprise him with a special “just because” gift. You can surprise someone you love with the perfect gift too. 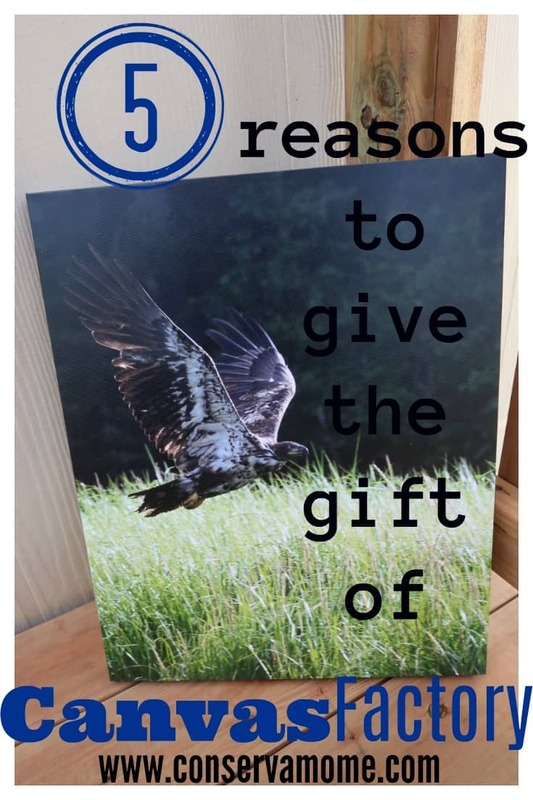 Read on to find out 5 reasons to give the gift of Canvas Factory. The quality of the print is amazing. The canvas is thick and even. The backing is sturdy and well done. The colors are exactly the right shade. I couldn’t be happier with this print from Canvas Factory. Canvas Factory helps you personalize your pictures so they are exactly what you want. You can choose to tint the color of your picture, go for black and white or sepia tones or add letting. By choosing Canvas Factory you are choosing to give yourself a huge amount of options for the perfect personalization. Canvas Factory doesn’t just print on canvas. You can choose canvas, acrylic, or glass. You can choose to have a collage printed, a split image, or a floating from canvas. Canvas factory has something for everyone and every style. I dare you to do some price comparisons. I bet you can’t find any other company that offers the same quality at such a low price. Plus, the shipping is really fast. The recipient of your gift of a Canvas Factory Print doesn’t need to know how little you paid for such a classy gift. It can be your little secret. 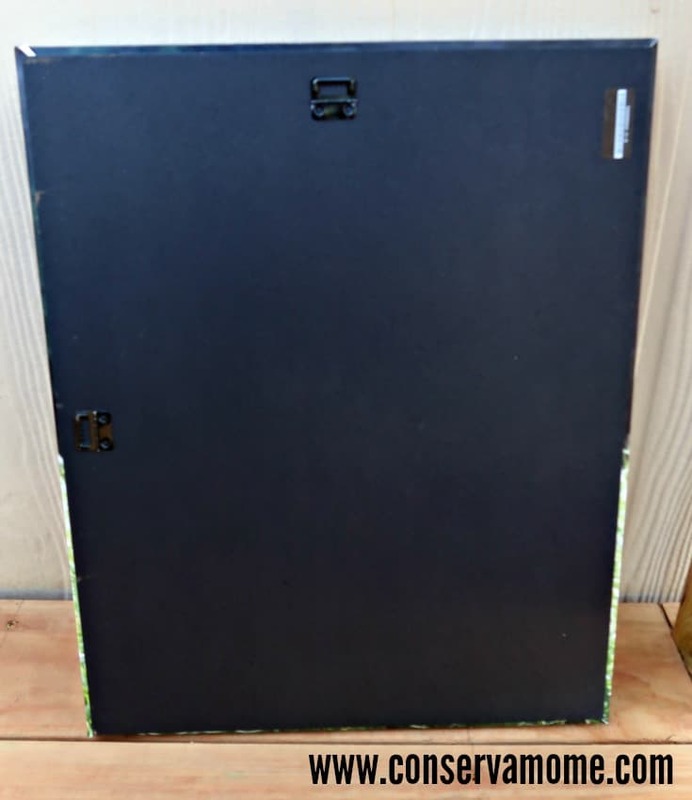 Because of the vast array of styles, materials, and customization Canvas Factory offers you can be sure that you are creating and purchasing the perfect gift every time. Browse around their website to get great gift giving ideas. Go on and get creative and give someone you love a gift they will cherish forever. Now for the best part! One lucky winner will get a Standard Canvas print (16×20” / 40x50cm) of their own! This prize retails for $55 and giveaway is open to US & CAN. Must be 18yo+ to enter. Giveaway ends on 9/3 at 11:59pm EST. Good luck!! I would love to keep the print I would make. I have been wanting a canvas print made of us for a while I just haven’t ever made one yet! I think I would give it to my MIL as a gift. If I win, I would keep it! Thanks for the chance! I would give this as a gift to my Father in Law! I’d keep it! Canvas prints are my favorite way to decorate! I would love to gift it to one of my daughters. I’ll give this to my son. I would choose to keep it as we are just getting our wedding photos back and I would like to use it for those! Our first grandchild was born sleeping on 12/31/16 at 39 weeks I would love a canvas of one of his pictures. I would give it to my daughter to display in her living room of her son. Thank you for a great giveaway. I think I might gift myself with this print. I would keep the print for myself. I never thought of this. What a great gift idea! I never thought of this. What a great gift idea!!! I would probably use a vacation photo and keep it to hang in my house. I would choose a print of my family, keep it and display it in my office. I had got one for my youngest son last year of his 2yr. Old daughter. I would keep this one. I would get one of my two sons,me and my husband. I would keep it for a family print! I would gift this canvas to my parents. They are currently in the process of moving after 23 years in their house! They could definitely use a nice piece to hang in their new place. I will keep the print and have a canvas done of a family photo. I have some vacation photos that would be perfect for canvas and they’d look lovely in my family room! I would choose to keep it for that! I would definitely keep it!! I would love to make a special print for the grandparents! If I win, I will keep the print!